Dr. Yi Cui seems to get inspiration from food. A few years ago, his research team came up with a “yolk-shell structure” that helped contain the high amount of lithium that silicon anodes were able to absorb. That battery design promised much, and an embellishment of that design seems to hold even greater promise. 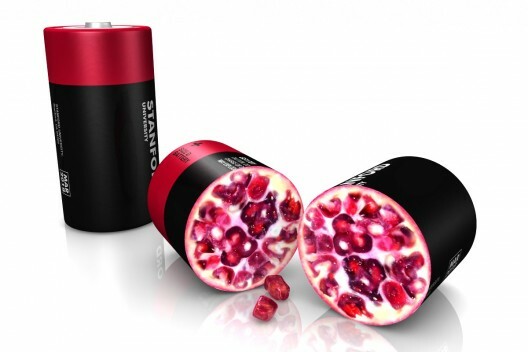 His newest effort, working at Stanford University with the Department of Energy’s SLAC National Accelerator Laboratory, features an electrode “designed like a pomegranate – with silicon nanoparticles clustered like seed in a tough carbon rind.” This approach, according to its inventors, overcomes several remaining obstacles to the use of silicon in a new generation of lithium-ion batteries. Cui’s team has been working on preventing anode breakup for the last eight years, exploring how to reduce silicon to such small pieces that can’t be broken any farther when being charged. 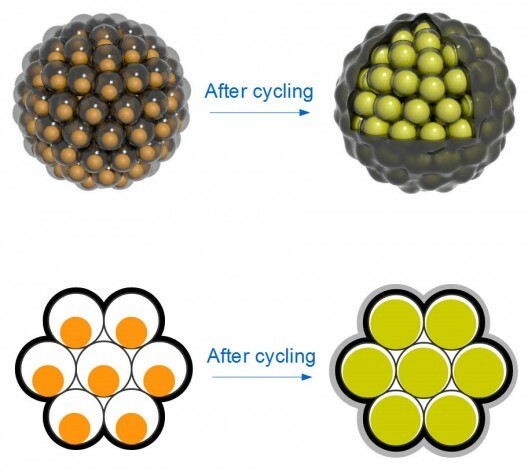 The silicon nanoparticles are then encased in carbon “yolk shells,” emulating the original research model. The carbon shell allows swelling and shrinking without breakage and prevents the buildup of “gunk” resulting from such breakdowns. This silicon-lithium gunk prevents efficient transfer of ions and reduces battery performance. To make these breakthroughs commercially viable, Dr. Cui and his team need to simplify the process and find a “cheaper source of silicon nanoparticles.” Keeping with the food inspiration for the project so far, they may use rice husks – unfit for human consumption, produced by the millions of tons, and 20 percent silicon dioxide by weight. Liu reported on the ease of converting rice husks into pure silicon nanoparticles in a recent edition of Scientific Reports. The battery is reported have “remarkable performance.” Green Car Congress reports that its reversible capacity reached 2,350 mAh g-1 for a rate of c/20 (1C ¼ charge/discharge in 1 hour). 2,350 Amp-hours per kilogram would be about 10 times the current norm for the best lithium-ion batteries. Volumetric efficiency is more than twice the 600 mAh cm-3 obtained for graphite anodes. The team’s findings are published in the journal Nature Nanotechnology.